This is a guest post by David Broockman, a PhD student in political science at Berkeley. Many have already commented on the significant implications last week’s Supreme Court decision will have for racial minorities’ equal access to the ballot box, consequences that began to materialize within hours of the Court’s decision. Less attention has been paid to another of the VRA’s missions the Court also undermined last week. By fostering the creation of majority-minority districts, the VRA has for decades helped minorities overcome opposition to their candidates of choice and elect representatives of their race. In wake of the Shelby County decision, the Justice Department will have much greater difficulty encouraging the election of minorities to office. Does it matter whether racial minorities can elect members of their group to Congress, state legislatures, and school boards? In two articles forthcoming in the American Journal of Political Science, I present results from field experiments illustrating the unique role officeholders who are members of racial minority groups play in advancing minorities’ political interests. Elected officials often make important decisions when partially or even fully hidden from voters’ watchful eyes, such as in legislative bargaining behind closed doors, during oversight hearings, or on the many votes that escape public attention. In such settings, legislators’ own personal priorities and desires—their intrinsic motivations—may influence their choices a great deal more than their desire to win their constituents’ favor. The experiment systematically tested whether black legislators act like this legislator suggested, expending more time and effort than their colleagues to advance blacks’ interests even when it is unlikely to help them win re-election. Specifically, in the experiment, I randomly assigned American state legislators to receive an email from an ostensibly black individual asking for help signing up for unemployment benefits. Crucially, I randomly assigned whether the writer claimed to be from a city in each legislator’s own district or from a city far across the state, thus manipulating the degree of political incentive the legislators had to respond. The results show that this legislator was right. 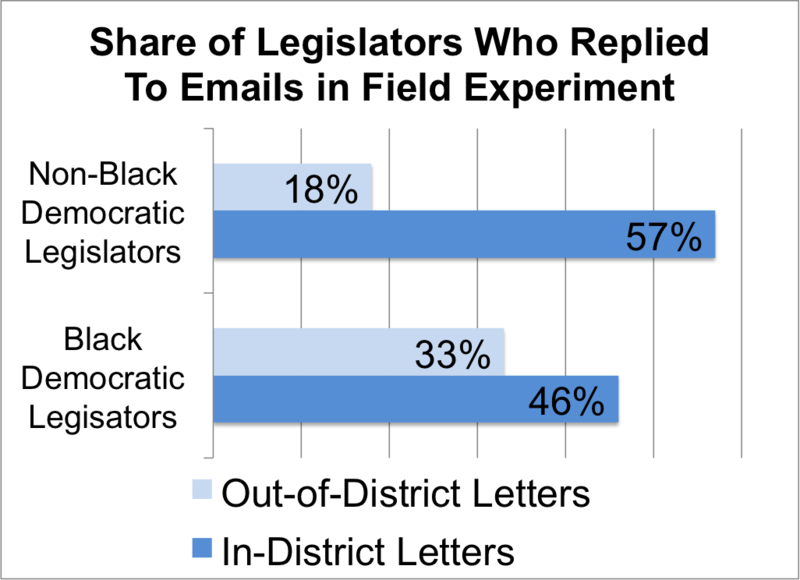 As shown in the figure below, all legislators were somewhat less likely to respond to the letter when ostensibly from an individual living outside their district. However, although non-black Democrats were far less responsive to the out of district letter, 39 percentage points, black Democrats were far less sensitive to this lessening of their incentives. Once the incentive to respond dramatically diminished black legislators typically responded nonetheless, although their colleagues typically did not. Politicians often make decisions that their constituents cannot observe about what to advocate or how hard to work on their behalf. The experiment suggests that black legislators expend much greater time and effort than their non-black colleagues to advance blacks’ interests even when their constituents are unlikely to reward their efforts. Those interested in details can read more here. Legislators of course do not only rely on their own opinions when deciding how to vote and what issues to focus on; they also rely extensively on communications from constituents (see evidence here). 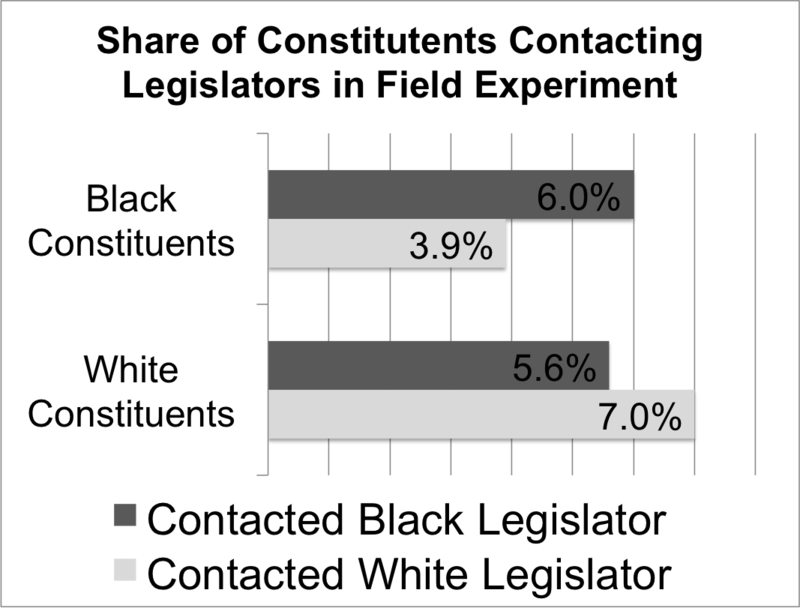 A second experiment I conducted shows how biases in the communication legislators receive from constituents can lead even well-intentioned legislators to exhibit racial favoritism because they are more likely to hear from constituents of their race. The experiment was inspired by extensive research in social psychology which shows that people are typically more willing to communicate to other individuals of their race in day-to-day life. The experiment examined whether people act much the same way when deciding whether to communicate to their legislators, being more willing to communicate to legislators of their race. To test this hypothesis, the experiment exploited the fact that many multi-member state legislative districts in Maryland are served by both black and white state legislators. In the experiment, I contacted thousands of residents of these districts and asked them whether they would contact their legislator about a political issue. Crucially, I randomly assigned individuals to be asked whether they would like to communicate to their black or their white legislator. The individuals did not know they were being studied and were initially led to believe the call were a routine effort to connect constituents and their legislators. Were people equally likely to contact legislators of their race? The results are shown in the figure below. Constituents in these districts were markedly more likely to agree to contact legislators of their race—black constituents were about 50% more likely to agree to contact their black legislators, while white constituents were about 25% more likely to contact their white legislator. Such differences in who legislators hear from are likely to have important consequences: two legislators serving the very same district may nevertheless have very different visions of their constituents’ priorities if they hear much less from people not of their race. Such distorted communication may lead non-minorities who represent minorities to unwittingly underrepresent their views, even they make every effort to be even-handed. Those interested in the details can read the article here. These results suggest that measures like “minority influence” districting that do not ensure the election of minorities to office may not be enough to ensure minorities’ equal political voice. First, minorities in government appear significantly more likely to work to advance minorities’ interests in the many settings where political decision-making is not on prominent public display. Moreover, even if legislators did make every effort to represent their constituents even-handedly, the distorted communication they receive from their constituents may still lead them to provide unequal representation to those not of their race. Really interesting, and I like the design. I think it really nicely confirms a lot of the observational results we have seen in this literature and provides a new way to think about testing hypotheses about representation.